Facebook Advertising is Changing. Here’s What You Need to Know. Facebook’s advertising platform dates back to the first introduction of Facebook in 2004, undergoing significant changes over the years to become the powerhouse advertising platform it has become today. Facebook generates a staggering 98% of its global revenue from its advertising platform alone – an estimated $40 billion in 2017. And with more and more additions to the platform rolled out on a seemingly incessant basis, Facebook shows no signs of slowing down its investment in offering paid advertising options. With more and more “sponsored” ads appearing in users’ timelines during the past few years, however, along with news of Russian operatives and data security breaches in the past 12 to 18 months, Facebook and its advertising practices have been under a bright spotlight recently. In response to the growing attention – up to and including a Senate hearing for founder and CEO Mark Zuckerberg – Facebook is implementing a slew of updates to its advertising platform to combat allegations of data misuse, a rise in hate speech and discriminatory targeting, and election meddling by foreign operatives. While these changes will affect everyone advertising on Facebook, each has its own implementation date – and some will impact certain industries more than others. Below is a list of all of the changes coming to Facebook’s advertising platform over the next three months, and what you need to know about each. In April 2013, Facebook’s advertising platform unveiled targeting based on Partner Categories. This information was complied by third-party data aggregators such as Acxiom, Epsilon, Experian, and Oracle Data Cloud, and allowed Facebook marketers to target users based on behavioral information both on and off line – things like homeownership, purchase history and buying patterns, or occupations. This third-party data allowed advertisers to zero in on their desired audience and propelled Facebook’s advertising platform to become a rival to Google AdWords within just a few years. With the recent uproar regarding privacy issues for Facebook users in the wake of the Cambridge Analytica breach, along with the new GDPR regulationsimplemented in Europe, Facebook announced on March 28, 2018 it would discontinue Partner Categories targeting, with a gradual implementation over six months. Beginning August 15, 2018, Partner Categories will no longer be available for any new campaigns or ads created. Any existing ads running before that date using Partner Categories data will remain active until October 1, 2018. All Facebook advertising campaigns using Partner Categories targeting will stop delivering automatically after this date. 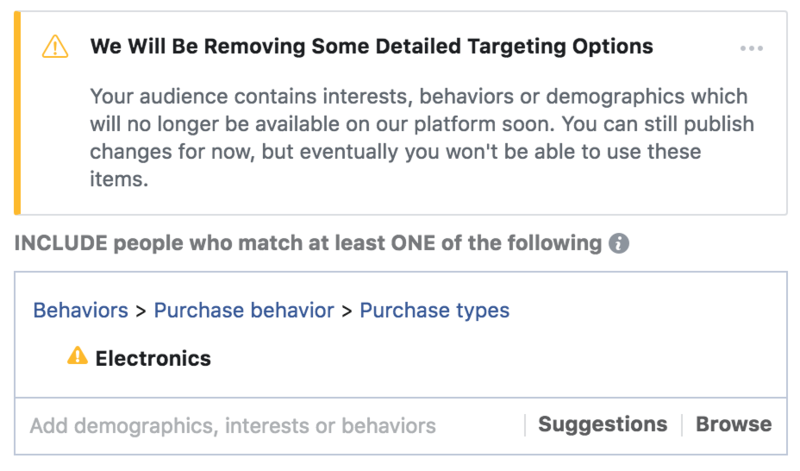 Unfortunately, the detailed targeting in Facebook’s Ad Manager does not specify which targeting parameters are part of the Partner Categories data, so we don’t have a clear picture yet of exactly how many targeting options will be removed. New warnings appear only after you select a Partner Categories’ targeting parameter. Because this data has been such an integral part of Facebook’s advertising platform for the past five years, marketers anticipate the removal will have an impact on the effectiveness of Facebook ads. New ads launched after August 15 will give us a better idea of the targeting available after the removal of Partner Categories. Facebook’s Custom Audience feature allows users to upload a list of contacts, creating a custom-built audience to see a company’s ads. This allows companies to target users who signed up to receive emails or purchased something online. For law firms, this could include a list of current or former clients. This feature has always been a great way to target users already familiar with your brand but perhaps in need of a reminder. This new feature is in line with rules already in place for most marketing platforms and a good addition to Facebook. The majority of email service providers (ESPs) have long required disclosures of this nature when uploading a list, ensuring consumers don’t receive unwanted and unsolicited emails. For Texas attorneys, the State Bar of Texas requires any direct mail piece to disclose “how the lawyer obtained the information prompting the communication to solicit professional employment” in Texas Disciplinary Rules of Professional Conduct, Rule 7.05(a)(5). In effect, Facebook is simply ensuring advertisers have obtained consent to use the data provided by the consumer for marketing purposes. When uploading data to create a Custom Audience, simply select one of three options indicating the Original Data Source of the uploaded content: from customers and partners, directly from customers, or from partners. In response to the Cambridge Analytica data breach earlier this year, Facebook founder and CEO Mark Zuckerberg endured a five-hour Senate Commerce and Judiciary joint session hearing on April 10, 2018, answering questions regarding Facebook’s privacy and data security protocols. While much of his testimony was spent explaining the basic principals of Facebook, Mr. Zuckerberg was quick to invoke the promise of artificial intelligence (AI) to help Facebook review ads with potential hate speech or other problematic content. Following the hearing, Facebook posted a statement on its website on April 24, 2018 expanding on that promise. In addition to stricter guidelines regarding the content of ads, Facebook also instituted a more robust review of the targetingparameters for ads. These efforts to promote one of the core tenants of its advertising principles (published just last November) – that advertising should be “safe and civil; it should not divide or discriminate” – is likely in response to the increased extreme political rhetoric surrounding the 2016 election, including the news that Russian operatives utilized Facebook’s advertising platform to target millions of Americans with divisive political ads. Facebook does make it easy to contest the decision, with a button marked “Appeal” located inside of the warning notice. Clicking the appeal button prompts a real person to review the ad content and targeting, and either approve or disapprove the ad. This process, however, takes time, with response time ranging anywhere from less than an hour to several days. While Facebook’s newfound robust attitude towards protecting against hate speech and discriminatory targeting in its advertising platform is admirable, the heavy use of artificial intelligence to identify potential issues is creating previously nonexistent obstacles for companies attempting to utilize the platform in a responsible and ethical manner. Hopefully Facebook can work out the kinks in its AI review program to reduce the onslaught of disapproval notices for perfectly legitimate ads. As mentioned previously, between June 2015 and August 2017, Russian operatives targeted millions of Americans with thousands of Facebook ads in an attempt to influence voter behavior by inciting extreme emotional reactions about polarizing political issues. In response to these findings, Facebook launched a new Transparency Tool for Electoral and Issue Ads on May 24, 2018. 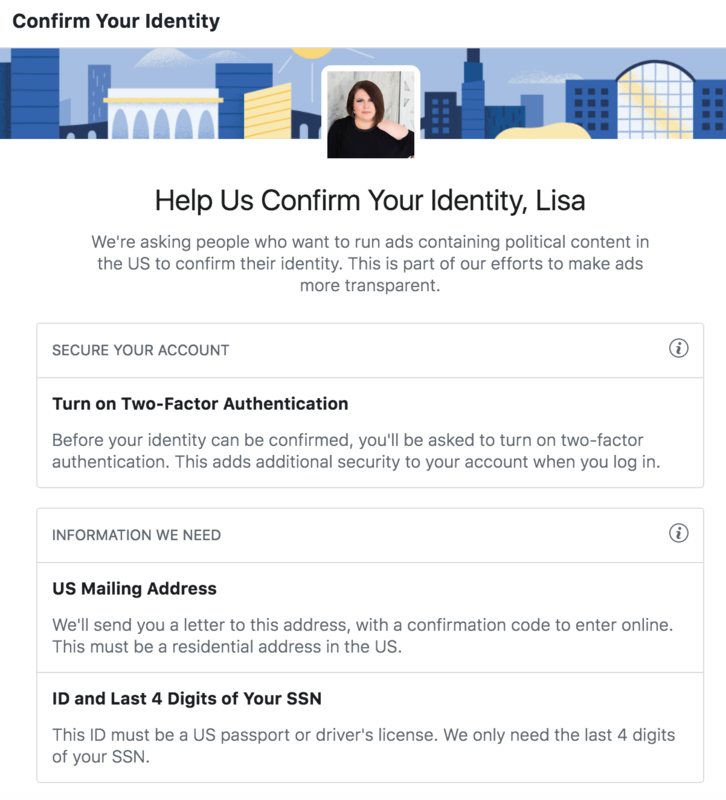 As part of the newly implemented system, Facebook now requires a Page Administrator to confirm his or her identity in order to run political ads on a Page. This is a multiple-step process, requiring several forms of identification. First, the user must enable two-factor authentication for his or her account. This requires a special login code texted or emailed every time someone tries to access his or her account from an unrecognized computer or mobile device. The user must then upload a photo of the front and back of his or her state issued driver’s license or photos of a US passport, as well as enter in the last four digits of his or her Social Security Number. Finally, Facebook sends a physical letter to a US address provided by the user containing a confirmation code, which must be entered online by a specified date included in the letter. These changes are particularly important for lawyers because of Facebook’s dependency on AI to review and screen ads for approval. 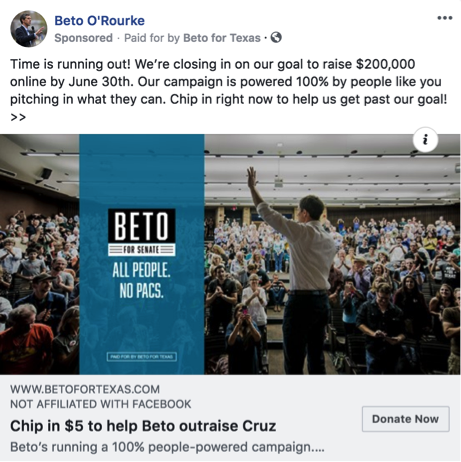 Over the past few weeks, we’ve seen even the most basic legal ads flagged by Facebook as containing “political content.” Because law firms use keywords commonly associated with politics, Facebook’s AI system tends to flag ads with words such as “county,” “civil lawsuit,” and “court,” and summarily disapprove them. While the appeal process is the same as mentioned above – and does move fairly quickly, for the most part – it creates yet another obstacle to launching oftentimes time-sensitive ads, and disproportionately affects industries with interests adjacent to the political sphere. While some of the changes mentioned above have already gone into effect, the true test of Facebook’s effectiveness as an advertising platform will come when the Partner Categories targeting data is removed permanently at the beginning of October. With more than one billion active Facebook users, the platform can hopefully balance the issue of user privacy with the ability to deliver expert targeting tools to its advertisers. Additionally, Facebook must continue to evolve its AI reviews of ads and targeting to help streamline the process, particularly with the new stringent guidelines surrounding political ads adversely affecting the legal industry.